"Pineapple stem may combat cancer" is the title of an article published today on BBC News. Researchers say that two components found in the stem of the pineapple may be active anti-cancer agents. "In searching for these components, we discovered the CCS and CCZ proteins and found that they could block growth of a broad range of tumour cells, including breast, lung, colon, ovarian and melanoma." I am always flabbergasted to see how things that have been known for years or even decades are "discovered" by pharmaceutical research without so much as a word of mention that the reviled "quacks" have been using enzymes to cure cancer for decades. It seems like there is an impenetrable wall between two worlds of medicine. The "official" world of pharmaceutical medicine and the "alternative" world of those who use natural methods and a comparatively light touch in their attempts to support the body's own healing mechanisms. So it is good to see that recognition seems to be dawning. "The origin of many anti-cancer drugs can be found in nature", the article quotes Dr Julie Sharp, at Cancer Research UK. Dr Michael T Murray on What Are Proteolytic Encymes? Two molecules isolated from an extract of crushed pineapple stems have shown promise in fighting cancer growth. One molecule called CCS blocks a protein called Ras, which is defective in approximately 30% of all cancers. The other, called CCZ, stimulates the body's own immune system to target and kill cancer cells. It is hoped the research, carried out by Queensland Institute of Medical Research, could lead to new anti-cancer drugs. The extract studied by the scientists, bromelain, is a rich source of enzymes and is widely used as a meat tenderiser, to clarify beer and tan leather hides. The Queensland team discovered that the extract also had pharmacological properties and could activate specific immune cells while, simultaneously, blocking the immune function of other cells. Lead researcher Dr Tracey Mynott said: "We suspected that different components of the crude mixture might be responsible for bromelain's biological effects. Both CCS and CCZ are protease enzymes, more usually associated with breaking down proteins, as in the digestive process. Dr Mynott said it was the first time this class of enzymes had been shown to have a specific effect on the immune system. "The way CCS and CCZ work is different to any other drug in clinical use today. "Therefore, CCS and CCZ will represent a totally new way of treating disease and potentially a whole new class of anti-cancer agent." Dr Julie Sharp, at Cancer Research UK, said: "The origin of many anti-cancer drugs can be found in nature. "However, it's early days for this research and the real test will be to see if the effects seen in the lab can be reproduced successfully in patients." Federal University of Technology Owerri ,PMB 1526 Owerri Imo State Nigeria. I would be very happy to receive more of the article concerning foos sc. If possible, please I WOULD LIKE YOU NTO HELP ME TO GET SCHOLARSHIP VISA TO STUDY IN AUSTRALLIA. If I eat more pineapple will this help prevent cancer? Are the enzymes in the actual fruit as well as the stem? I can not imagine eating the stem. Great on eating more pineapple Melissa. Well, most of the beneficial enzymes seem to be concentrated in the stem - also in the core of the fruit, the one that is cut out leaving a hole in your canned pineapple slices. If we are to believe what the scientists found, eating pineapples should at least help keep cancer away. Of course there is no guarantee, but every little thing helps. in any search engine and see what you find. Pineapples are food and have been eaten for centuries. As long as you don\'t exaggerate, they should not cause any untoward effects. 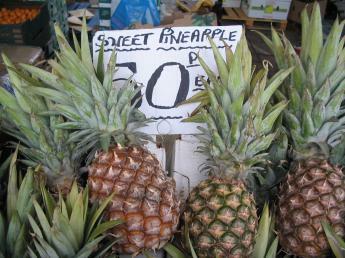 I have a small cooperative which is engaged in the production and sale of fresh pineapples(Victoria). I have read your articles and i am selling pineapple stem in cooperative fairs,informing the general public about the good effects that the pineapple stem can bring including its therapeutic benefits. I have peeled the stem and made some people taste it.It is eatable. I wanted to know the dose that i can recommend to the people who are buying. I have told them to store it in a refrigerator and they can cut the stem into slices and they can consume two small pieces per day during meals.Is the advice good?